If any of you are like Gabby and myself, we consume brussels sprouts on the reg. It is such a easy and quick vegetable to cook up while allowing us to get our “greens” in. We would normally just pour some coconut oil, salt, pepper, and garlic powder and bake for 20-25 minutes. Recently, I purchased Juli Bauer’s Paleo Cookbook and the recipes in here are to die for! Seriously, I have never had a cookbook where I literally want to cook every single item. If you are stuck in a rut with your cooking, please purchase this, your taste buds will thank you. Gabby and I cracked the book opened last night and literally drooled over this recipe! We had to make it ASAP. This is so so simple and easy to make. Toss the halved brussels sprouts in melted coconut oil and spread out evenly on lined sheet, sprinkle with sea salt. Roast for 30-35 minutes, until crispy. 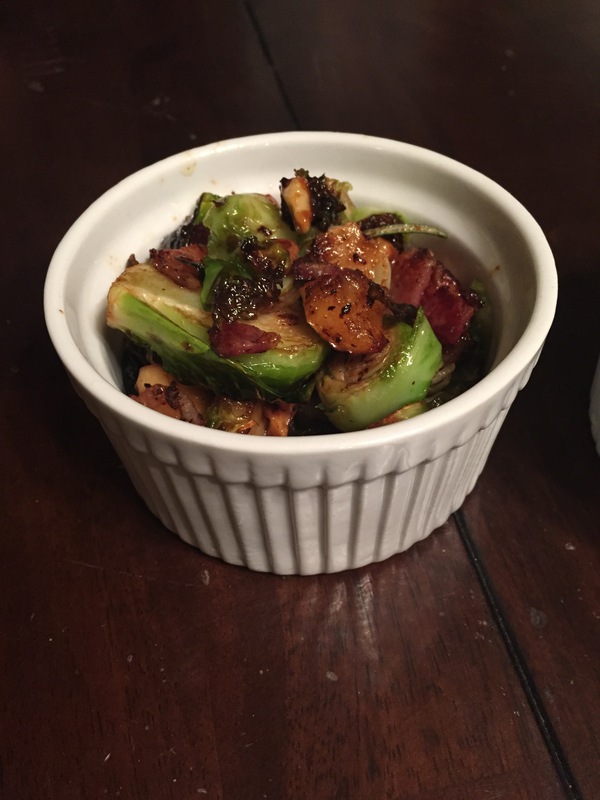 While the Brussels sprouts are roasting, cook the bacon in a large sauté pan over medium heat until crispy, about 10 minutes. Remove from the pan, set aside to cool, and then chop into small pieces. In the same pan, sauté the diced apple in the bacon fat until soft. Remove from the heat and set aside. Make the candied walnuts. Melt the butter in a small saucepan over medium heat. Add the coconut sugar and walnuts and toss to coat for about 2 minutes. Place the pan with the apples back over medium heat. Add the candied walnuts, roasted Brussels sprouts, bacon, and rosemary, season with a bit of salt and pepper, and then mix to incorporate. Serve immediately. And BOOM! You can enjoy your delicious and healthy vegetables. Someone try to tell me after tasting these that I you don’t like brussel sprouts! Previous Previous post: Get Results NOW!! Next Next post: Are You Doing Your Homework?